Romney’s Unabashed Lies Are Political Gold, So Why Stop? The GOP presidential campaign is flat-out lying about Obama’s welfare record, and it’s working like a charm. The sixteenth anniversary of TANF hit this week, and the Republican presidential candidate spent his time lying about the president’s position on it. The president, Mitt Romney insists, stripped the work requirements out of the temporary assistance program that replaced welfare for poor families under Bill Clinton in 1996. Good as it is, a bit of the Boss won’t clear things up. As even NPR pointed out this week, the Romney campaign is dredging up the welfare debate because as a piece of political hot button–pushing, it works like magic. PEGGY TESTA: You know, we think that the fact that the work requirement has been taken out of welfare is the wrong thing to do. SHAPIRO: I told her that’s not actually what happened. TESTA: You know. I, at this point, don’t know exactly what is true and what isn’t, OK? But what I do know is I trust the Romney-Ryan ticket and I do not trust Obama. 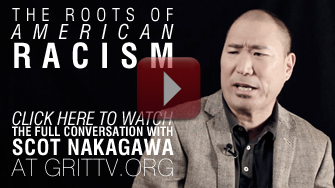 Racial justice activist Scot Nakagawa who has started the excellent RaceFiles, talked about the “we” factor in this conversation, recorded earlier this summer in New York. So, our reluctance to fund human needs is wrapped up in a fear that the funding will go to other sorts of humans? I asked. Barack Obama can fact-check all he likes, but it won’t make this go away. Romney only looks like a stiff; his campaign’s as happy in the gutter as Gingrich ever was. The GOP is betting that race-baiting will beat the Boss, and history suggests they’re right. American attitudes are shifting, day by day, but majority/minority demographics aren’t destiny—not yet. Talk about it Mr. President: in America, what does “we” mean? And what’s the price we pay for hearing “we” and thinking “them vs. us”?